In an extended survey lately in Norway about possible candidacy of the country in the European Union the majority of the Norwegians answered with an impressive scepticism. 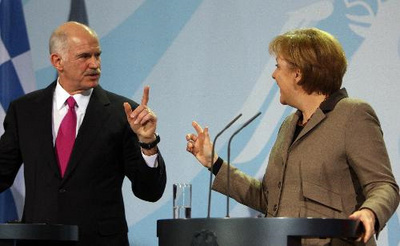 A lot of the sceptics excused their decision in the Greek financial situation and the German reaction. The thing is that following what’s going on lately with the Euro and the German reaction or better the non political reaction, would you want to be a member in a union that lacks unity? But first things first; the message from the Greek government that they don’t want money but political support and European political support to stop the financial profiteers is loud and clear. Actually is so loud and so clear that if the German government, the German people and the German media cannot hear it then they have better check their ears and visit their doctor. Second thing is that some try to cover their damages from the American stock-market blow out in Europe, playing profiteer games that damage not only nations but seriously the whole union. The third is that the cure against these profiteers’ games in the European political unity and the support to Euro and this is where EU has failed the last few weeks with main player Angela Merkel’s government. So the Greek crisis unveiled the crisis that continues for years in the fundamentals of the European Union and nobody wants to accept, actually is not the case of accepting but taking the responsibility and to be precise take the political responsibility to do something about it. Europe failed to support politically Greece and since the latest news are already out, Europe most likely will fail to support Portugal. Actually Europe failed to support politically the Euro. But since this whole case looks like a gigantic puzzle let’s go to some other pieces. Greece is not the only European country and especially not the only country of the euro-zone with huge debts. Greece has the highest debt. All and I emphasize that; ALL the euro-zone countries have crossed the red line with their debts. Portugal, Spain and Ireland are not far back from Greece but that doesn’t mean that Italy, Britain and Germany are far behind. The difference stands on the accounts. Since Angela Merkel is the one who says no to any political support to Greece e let’s see some important pieces from the German economy. The debt of the German economy is a mystery well covered with accounting tricks and it is, mainly covered with internal loans from the heavy industry and the exports. That doesn’t mean that Germany is fine. Actually Germany hasn’t still shorted out the cost of the unification. Thirty years after uniting in one two pieces where the one had unknown inflation and unknown unemployment with the most optimistic calculating inflation somewhere around 20% and unemployment in some areas reaching 40%, with the necessary to govern bureaucracy, state and social structure in ruins and that from the one side without the other side feeling any better, let’s not forget that unemployment in West Germany was reaching 10% in 80s then we are not talking about economics but miracles and we all know that miracles happen only in fairytales. The unification would have never happened if the politicians hadn’t secured the support of the industrialists and the bankers. From their side the industrialists and the bankers got a cheap DM and dispirit for work, work force. A work force that would work literally for pennies and continues doing so. There was no German miracle behind the German economic miracle after the fall of the wall; it was pure and raw capitalism. And the government instead of been in debt with foreign banks and international institutions became depended from the German industrialists and bankers. Then happened the miscalculation. Nobody, actually nobody at all was expecting what happened with the Euro. Suddenly the German exports weren’t so strong, even expensive compared to the Chinese especially and even German products and the German industrialists started having problems; they were depended on the European market. That explains even the desperate German support to the Turkish candidacy and the quick expansion to the East European counties. Just to get an idea for what we are talking about think that Greek imports from Germany in food, household products, cars and light industrial products reached the 250 million Euros a month! If Greeks decide to boycott German products due to German populists and media’s stupid and prejudice behaviour the damage to German economy will be at least serious. After all their Dutch neighbours have the experience from something similar that happened a decade ago and they can explain to them how it worked. So the European markets are getting tighter and the German industries need to sell and the only thing that stops them at the moment is the expensive Euro. So Mrs. Merkel plays games, too many games. Election time is closing in Germany and Angela knows that without the help from the industrialists and the bankers, she’s doomed. Actually she will fall to the same trap she made for the social-democrats. In the name of unity and in front the international economy crisis she will have to quietly support a social-democrat government and there is nothing Angela hates more. So she’s exchanging the support of the industrialists and the banks she’s offering a weak Euro under any cost! But how high this coast can be? By playing games with the Euro, the main symbol of the European unity is playing games with the foundations of the Union and all that to serve internal politics. Amazingly the other partners are not able to do anything except calling for understanding, tied themselves in the labyrinth of petty politics and compromises they created to serve internal agendas. And the question I put in the beginning, would you ever join a union that cannot support itself? The question is a sort of tautology, given that the logical outcome of any union where the centrifugal forces are stronger than the centripetal forces is ipso facto a flawed union. Do the Norwegians know something the rest of Europeans don’t know yet? As I have repeatedly pointed out, the lesson of Italian unification in 1860 is instructive here.